Learn the basic nursing skills you need in order to become a Certified Nurse Aide. Enjoy in-class lectures, skill-development labs and clinical studies and learn how to properly turn a person in bed, assist someone with walking, measure a person’s pulse and breathing, washing and applying lotion and more. Students will spend four weeks in the lab and classroom learning and developing skills. During the last two weeks, students will take turns spending two full days in a clinical setting and gaining hands-on experience. This is a certified course and will provide you with the hours required to become a Hawaii Certified Nurse Aide. 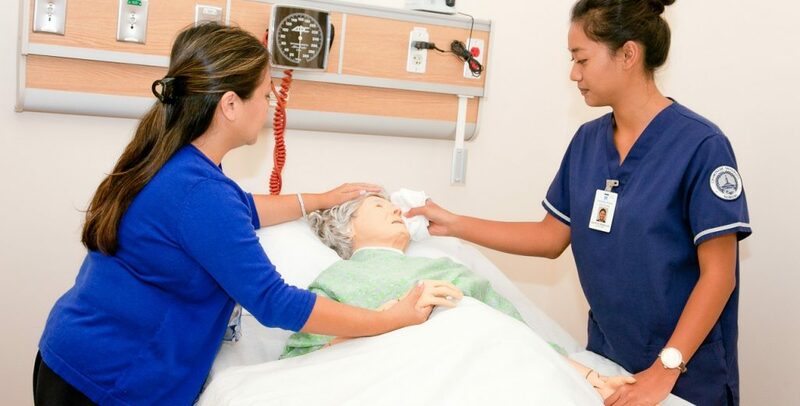 It will also prepare you to take the Nurse Aide Competency Exam, which you must pass in order to become a Hawaii Certified Nurse Aide. This Certified Nurse Aide certification is mandatory for all Chaminade University nursing students. Dr. Eurina Cha is a certified advanced public health nurse and a nursing instructor at Chaminade University of Honolulu. She has an extensive clinical nursing background in public and community health, surgery, acute inpatient rehab, long-term care, case management and has been a professional consultant for 15 years. Dr. Cha received a Ph.D. in public health with a specialization in community health from Walden University. She is the Hawaii Chapter President of the Overseas Korean Nurses Association and a chair of the Hawaii Korean Nurses Association. The tuition cost includes four weeks of in-class and in-lab training and two weeks of hands-on clinical experience. The course textbook and scrub uniforms are also included. This does not include the Hawaii Certified Nurse Aid exam fee. On-campus housing is available for those who would like to stay at Chaminade for the duration of the program. Attendees will reside in the residence halls with gorgeous sweeping views of downtown Honolulu and Waikiki. Daily rates range from $50-80. There is also an additional $100 deposit and $50 cleaning fee. Linens can be provided for an additional $39. The CNA Training Program is subject to cancellation due to low enrollment. Decisions on cancellations will be made no later than two weeks prior to the beginning of program. If this program is cancelled due to low enrollment, a full refund will be issued.